[Note: This is a guest blog post by Dr. Tansu Küçüköncü]. Thales Academic Publisher publishes 23 open-access journals and organizes scholarly conferences. It also publishes academic books. It is included on the list of questionable publishers. Strangely, two of its journals (the International Journal of Advanced and Multidisciplinary Social Science (JAMSS) and the International Journal of Advanced and Multidisciplinary Engineering Science (JAMES)) are also found on the website of another publisher, Scientific & Academic Publishing (SAPUB), which is also included on the list of questionable publishers. Also, seven of the publisher’s journals (JNSR, JEDS, JBAH, JIEA, RJFA, RHSS, JSTR) are included on another publishing platform, that of the International Institute for Science, Technology and Education (IISTE), a publisher is also on the list. It is emphasized that six of the journals in IISTE (all except JSTR) have been published for at least five years. It is said that all seven journals in IISTE are published jointly by both Thales Academic Publisher and IISTE. However, when you access the journals through the IISTE website, there is no indication that the journals also appear on the Thales Academic Publishing website. The editor-in-chief of the two SAPUB / Thales journals is the same, Fikret Mazi. Fikret Mazi is also the editor-in-chief of three of the IISTE journals. One of the journals, the International Journal of Thales Solar Energy Reviews (JTSER), which promises fast publication in 20 days, is supported by TÜBİTAK (the Scientific and Technological Research Council of Turkey). Its editor-in-chief is Furkan Dincer. Thales Publisher also has thirteen additional journals which also promise fast publication in 20 days. It is interesting that Thales Academic Publisher (Tales Akademik Yayincilik) has no physical address, nor does it list a phone number. Probably it has no official registration anywhere. The only way to contact Thales Publisher is through an anonymous e-mail, thales.editors@gmail.com. Although its website (http://www.thalespublisher.com) has no information about who its owner is, it’s possible the owner is Omer Faruk Farsakoglu. The mysterious / fictitious / anonymous / unofficial Thales Academic Publisher, which is contactable only via an anonymous email, is sponsoring several conferences with Kilis 7 Aralık University in Turkey in 2016 at several locations. The chair of these conferences is Ömer Faruk Farsakoğlu. The conference at Kilis 7 Aralik University — to be held 19-20 March 2016 (International Conference on Natural Science and Engineering (ICNASE ’16)) — is interesting because it has dozens of Turkish university directors (vice rectors, deans) as scientific committee members. Retraction notice for plagiarism; the author is now a conference organizer in Turkey. In 2005, Ömer Faruk Farsakoğlu had a paper retracted because of plagiarism. Part of the retraction notice appears in the image above. According to new Turkish academic regulations, publishing articles in any journal or conference proceeding are enough to be an associate professor and then full professor. Moreover these articles bring salary promotions, up to 20 percent, to their authors. Prizes (such as best paper awards) given by any journals and conferences are also effective for promotion to associate professor and to gain salary promotions. Articles in journals that have published for five years or more bring more academic credit. Being the editor of any journal or organizing any conference is also an effective way to be promoted to associate professor and to gain salary increases. Under the old system, having one or two SCI (or the equivalent of it for other disciplines) articles was the requirement. The new system did away with this requirement. Since 2011, the TÜBİTAK ULAKBİM index for Turkish journals (which includes some journals which were deleted from SCI) (which includes 2 year-old journals) (inclusion criteria of which is suspicious) (deletion is almost impossible) is accepted as equivalent to SCI (and its equivalents for other disciplines). TÜBİTAK is problematic. There are some journals which are directly published by TÜBİTAK. One of the basic and major problems is that it refuses to retract even some 100% plagiarized articles, if the article is older than 5 years. Its decisions, especially details (how they decided, who decided), about ethical violations are secret. It refuses to share data used in articles. The new system can be summarized as: Everything is acceptable. In Turkey, associate professor is a title awarded by Turkey’s Council of Higher Education (YÖK). YÖK (or HEC) has no white or black list for journals and publishers. In the new system, publishing in Turkish journals and being cited six times in Turkish journals (there is way to determine these citations) are the new requirements. In the new system, conferences are promoted. YÖK has no white or black list for conferences and conference organizers. New salary promotions, up to 20%, are in parallel to this new system. Turkish academy is very problematic. The new system and the new salary promotions will create a crisis situation that will be unfixable. An increase in the number of gold (author-pays) publishers specializing in quick, easy, and cheap scholarly publishing. New Turkish journals and publishers and conference organizers and “international” conferences by Turkish academics and Turkish citation rings. Thales was an ancient Greek philosopher from Miletus on the Aegean coast of Anatolia. A continuing explosion in the number of low-quality and predatory scholarly conferences in Southeast Asia is confusing and annoying researchers in the region. One example is the so-called International Academy of Computer Technology (IACT) — which is not really an academy at all — whose headquarters address shows up as a dwelling in a U.S. state. The International Academy of Computer Technology (IACT) claims on its website that it’s a “nonprofit research and development organization,” a claim I doubt. It operates several scholarly conferences each month and publishes several open-access journals. Paying taxes on earned income in the U.S. and California? This is the house at that address, a small structure with a steeply-pitched roof and a tree-lined yard. Despite its claimed U.S. base, only a tiny proportion of its journals’ editorial board members are based in the U.S. The company lures researchers into presenting at its conferences (and paying the registration fees) by tempting them with offers to publish their conference papers in indexed journals, journals they themselves publish. The come-on, in a strange font, as seen on their conference website. Some believe that if a conference is the event’s 2nd or higher that it’s automatically legitimate — not true. I’ve gotten reports from several researchers in Indonesia that many there are being spammed to attend these conferences. Their publishing arm, also run from a house in San Bernardino. The people in the house on Mayfield Avenue in San Bernardino publish a lot of journals. Some — but not all — of the journals they publish are included on website for International Academy Publishing. I strongly recommend that researchers everywhere avoid this company’s conferences and open-access journals. I think the academic indexes that cover these journals have been fooled. denverjeffreyInternational Academy of Computer Technology3308 N Mayfield AveSelected submission paperTheir publishing arm, also run from a house in San Bernardino. There’s a new open-access publisher in town, and its name is Ology Science. I fear that the publisher may have a connection with the notorious publisher called OMICS International. Journal of Food Science and Nutraceuticals publishes quality articles with the support from scientists like you. We are aware of your reputation for quality research and trust worthiness in the field of “Food Science” and that is why you have been chosen as an Editorial Board Member for our Journal. We assure you International quality and standards of our articles published in our journal, using state-of-the-art prominent reviewers and editorial board. We also assure you of our best cooperation always. If you are interested, we request you to send a recent passport size photo (JPEG format), CV, Biography (150 words) and Research Interests for our records. We look forward to a close and long lasting scientific relationship for the benefit of scientific community. The spam email is pandering, smarmy, and full of errors. The name at the end is fictitious, like everything else about this publisher and OMICS as well. 3620 Dripping Springs Drive in Plano, Texas: You can’t hide! That address corresponds to — you guessed it — a dwelling. The domain name data for the website is blinded, and my best guess is that the publisher is really based in Hyderabad, India, home to many exploitative open-access publishers. The two journals missing from Ology Science’s fleet are two whose fields best reflect the publisher’s experience: Path-ology and Crimin-ology. UPDATE: There is another new publisher that is also spamming using the language and style of OMICS’ spam emails. Its name is Excelytics Publishers, and it lunched with four medical journals and one materials science journal. I would recommend deleting or ignoring any spam you receive from this new publisher. Be on the lookout for spam from a man using the fake persona of “Dr. Karl Heinz” and soliciting manuscripts for two open-access journals of abysmal quality. The journals use the initialisms JMESS and JMEST and claim they’re based in Germany, buy I suspect they are really based in eastern Turkey. Strong evidence of a weak journal. I hope you are fine, I am Dr. Heinz from Germany, we have journals jmest and jmess in your list. But we could not understand why you added our journals to your list. We are working with under formal process. I mean our ISSN numbers are valid, and we have more than 400 reviewers and 60 editors to serve academicians. Here is the some of explanation our journal, we kindly request remove our journal names from your list. Note that having a valid ISSN is not a measure of quality, and quality is something that both of these journals are saliently lacking. In another email “Dr. Heinz” indicated this as the publisher’s German headquarters address: Gemeinde Neukölln, 10965 Berlin. A source tells me that “Dr. Karl Heinz” is really Naci Kalkan, the person to whom the journals’ websites are registered. Kalkan is a “research assistance” at Bitlis Eren University in eastern Turkey. He’s published (or self-published) at least one article in JMEST, too. The world of scholarly open-access publishing is full of such deceit, and when it comes to open access, you can’t be sure of anything anymore. Proceed with extreme caution. denverjeffreyA mess indeed.Blah, blah, blah.Strong evidence of a weak journal.Not Teutonic at all. This past week I added a publisher called KnowledgeCuddle Publication to my list. The publisher’s name is silly and unprofessional, more evidence of scholarly open-access publishing’s decline into absurdity. At the same time, two U.S. universities implemented strong open-access policies, policies their faculties will be pressured to follow and submit to. The contrast is stark: the appearance of a completely ridiculous open-access publisher, and the appearance of what are essentially open-access mandates at two U.S. universities. Why are universities promoting and essentially mandating a publishing model that is increasingly becoming a self-parody? A product of the open-access movement. KnowledgeCuddle Publication uses the open-source Open Journal Systems software, a favorite of predatory publishers. The two journals cover academic disciplines already saturated with open-access journals — both are completely unneeded. The two universities that announced their new open-access policies are the University of Arizona and Florida State University. Now faculty at the two universities can publish in either of the two KnowledgeCuddle journals and be in compliance of their university’s open-access policy, provided they also submit a post-print of their work to their library’s repository. The policies only specify open-access and don’t address journal quality, a big problem with OA journals. Over the past couple weeks, some library email lists I monitor have been inundated with congratulatory messages directed at the two universities. I think this is an example of what anthropologist Michael F. Brown calls open-access triumphalism. I oppose open-access mandates as a violation of academic freedom. Fortunately, both universities’ policies provide easy escape clauses from the Orwellian policies. Still, I think the appearance of publishers such as KnowledgeCuddle, together with the tacit approval of such publishers by academic librarians and others is cause for worry. A cheap knockoff of the real thing. Here I’d like to sound a warning about two low-quality scholarly open-access publishers. I wrote previously about Pyrex Journals and have an update on them. I’ll also write about a new publisher with a dumb name: Scientia Ricerca. I originally wrote a blog post about Pyrex Journals in November, 2014. At that time, I reported that it had just launched with ten journals. Now it has 33. Pyrex is based in Nigeria, a place where strange and salient business names are common. Our Peer-Review Evaluation Process normally takes one to two weeks to complete depending on the number of rounds the Peer-Review Evaluation Process needs to take before an article is published. For the 1st-round Peer-Review Evaluation Process, it will take one week to complete. This is one of the more “successful” Nigerian open-access publishers. Most that are launched there flounder and disappear. Scientia Ricerca is a new open-access publisher. It launched with 14 biomedical sciences journals. I cannot figure out where it’s based. Its “Reach us” page gives a Southern California address, but I think the address is fake. The domain name data is blinded — except for the registrant information — which it lists as Gagan Chaitanya. According to our belief, there is no best price for knowledge expect the will to learn. Scientia Ricerca, is counted amongst the leading Online Publishing Groups that strive to spread scientific ideas and research information to all. If the article is rejected due to less quality, please explain the reason for its refuse. Refuse indeed. This advice is given in vain, for I doubt the publisher will ever reject a submitted manuscript. I strongly recommend that researchers reject all invitations of any kind they receive from these two open-access publishers. Appendix: Lists of journals from each publisher. New scholarly open-access publishers continue to appear at a fast pace. Here are three that launched recently — one with a generic name, one with a stolen name, and one with a suspicious name. The first thing you notice about this publisher is that its name doesn’t match its initials. Why isn’t it OAP? I think it’s a typo — a typo in their own name — and this is a bad sign. Also. The name itself is bland. Can you imagine trying to find this publisher’s website through a Google search? There is an OAE scientific financial support (about $10 000 000) for those authors who need to support their research. To make itself look legitimate, this publisher created its own medical association, the Asia-Pacific Association of Medical Research. They publish eight medical journals. My advice: Don’t send any papers to this publisher. This crazy publisher named itself after the open-source software it uses to host its journals. That’s right, Open Journals Systems is the name of the open-source journal management software made available by the Public Knowledge Project at Simon Fraser University in British Columbia. If the format looks familiar, that’s because the software is free, and it’s used by dozens if not hundreds of open-access publishers, especially predatory ones. Few publishers change the settings and just use the defaults, as this one does. This is to inform you that we hereby call for the submission of academic/research papers for publication. Please visit the journal’s homepages for more information. All the journals is part of the Open Journal Systems/ Public Knowledge Project. They publish four unneeded, broad-scope medical journals and one unneeded CAM journal. They claim to be based in “Manchester, United Kingdom.” Their website is minimalist, lacking much information conventionally provided by publishers. It’s also amateurish and unworthy of its name. My advice: Don’t even let your worst enemies publish here. This is the most dangerous of the three. This brand-new publisher launched recently with 33 journals in the biomedical sciences, journals covering fields already saturated with existing periodicals. There’s no need for any of these. Authors are usually informed within 4-7 days about the acceptance or rejection of their article and if accepted it gets published in 2 days of acceptance. What efficiency. I am not sure who’s behind this fleet launch of new journals. It smells like OMICS International, a company that already publishes hundreds of low-quality OA journals under many imprints. I think OMICS is trying to saturate the market to starve out the competition. My advice: It’s likely you’ll receive a spam email from this publisher. When it arrives, delete it. denverjeffreyOA what?No creativity whatsoever.This is the most dangerous of the three. The Thomson Reuters Master Journal List is not a journal whitelist and should not be used as one. Numerous low-quality and predatory journals are announcing their inclusion in this list as a mark or guarantee of quality, fooling many. The purpose of the list is to serve as a comprehensive list of journals included in at least one of 24 different journal indexes produced by Thomson Reuters. If a journal is included in one or more of these indexes, it appears in the master list. This is a problem because the barrier for entry into some of the Thomson Reuters indexes is very low. Take the index called Zoological Record, for example. It includes over 4700 journals, including many predatory journals that are unworthy of being included in any quality scholarly index. The journal shown in the top image above, Investigaciones Europeas de Dirección y Economía de la Empresa (IEDEE) is an example. It provides misleading information about the TR Master List. The Master Journal List includes all journal titles covered in Web of Science (WoS). This means that articles published in the journal will be searchable, discoverable and citable in Web of Science. This is somewhat misleading. It’s included in one of Thomson Reuters easiest databases to get into, its Emerging Sources Citation Index. As you see, according to the entry, it’s only included in Emerging Sources Citation index, a list I’ve documented as containing junk journals. I encourage all ministries of education, all universities and colleges, all academic departments, and all funding agencies to stop using the Thomson Reuters Master List as a measure of quality. The list is filled with dozens or hundreds of low-quality and predatory journals. Using this list as a quality indicator actually promotes the lower quality, open-access journals included in it, for it serves as advertising for them, drawing in authors seeking easy and fast acceptance of their article submissions. A screenshot of part of the hijacked journal’s website. A scholarly journal sponsored by a United Nations organization and published in Chile has been hijacked, with the hijackers creating a counterfeit website and widely soliciting manuscript submissions. However, unlike most journal hijacking cases, in this case, the apparent perpetrator’s name and location are easily found. The journal is CEPAL Review (Revista CEPAL), published in Santiago, Chile by ECLAC, the Economic Commission for Latin America and the Caribbean, a UN agency. The hijacked journal, which bears the same title of and tries to present itself as the authentic journal, is located here: http://www.cepalreview.org/ The hijacked journal uses the free Open Journal Systems software — a favorite of journal hijackers — for its publishing platform. Registrant Street: Vali Mithatbey Mah. Hastahane Cad. This registration data points to a Mr. Mehmet Bahaeddin Yorgun, from Van, a city in eastern Turkey also known as a center of international smuggling. An image from the authentic journal’s website. This hijacked journal is currently spamming, hoping to lure submissions from researchers needing a publication in an impact factor journal. The spam email (partial screenshot below) lists the journal’s editor as “Dr. Osvaldo Sunkle.” The correct spelling of his name is Osvaldo Sunkel. Hijacked journals continue to be a problem, fooling researchers in many countries. I’ve noticed an increase in their spamming in the past month. Please help me sound the warning about them so that researchers avoid their traps. I call on Mehmet Bahaeddin Yorgun to shut down this bogus website. Part of the hijacked journal’s spam. CEPAL Review journal is a peer reviewed multidisciplinary international journal publishing original and high-quality articles covering a wide range of topics in engineering, science and technology. Published papers in CEPAL Review will be indexed in very important Indexing & Abstracting databases such as Social Sciences Citation Index, SCOPUS, EBSCO, Ulrich’s Periodicals Directory and etc. The journal welcomes author submission of original and significant contributions. Articles submitted should not have been previously published or be currently under consideration for publication any place else and should report original unpublished research results. * Papers can be written in English, Spanish or Portuguese. * All articles are sent for blind peer review, with a very fast and without delay review procedure (within approximately two week after the submission). * Authors have to read through the author guidelines  carefully before beginning the submission process. * Submissions are accepted through the online submission system  Or via e-mail: cepalreview@gmail.com. *Arts and Literature, Agricultural Sciences, Biological Sciences, Chemical Sciences, Computer and Mathematical Sciences, Engineering, Environmental Sciences, Medicine and Physics, Management and Economic, Humanities, Linguistics, Philosophy, All scientific fields. denverjeffreyA screenshot of part of the hijacked journal's website.cepal reviewPart of the hijacked journal's spam. by Jeffrey Beall, January 3, 2017. Each year at this time I formally announce my updated list of predatory publishers. Because the publisher list is now very large, and because I now publish four, continuously-updated lists, the annual releases do not include the actual lists but instead include statistical and explanatory data about the lists and links to them. Potential, possible, or probable predatory scholarly open-access publishers: This year, 2017, marks the seventh annual release or announcement of this list, which is also continuously updated. The list this year includes 1155 publishers, an increase of 232 over 2016. There are now over one thousand predatory open-access publishers. 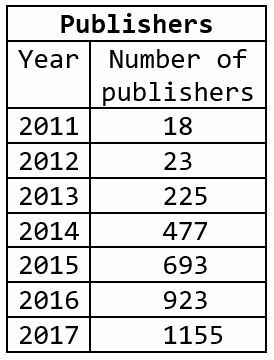 Number of predatory publishers, 2011-2017. Potential, possible, or probable predatory scholarly open-access journals: This year, 2017, marks the fifth annual release of this list, which is also continuously updated. The list this year includes 1294 journals, an increase of 412 over 2016. This is the first year that the number of standalone journals is higher than the number of publishers. 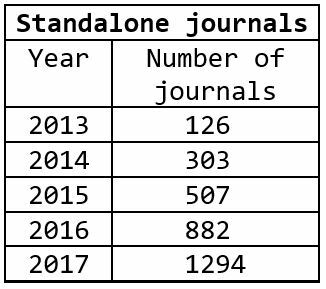 Number of predatory, standalone journals, 2013-2017. 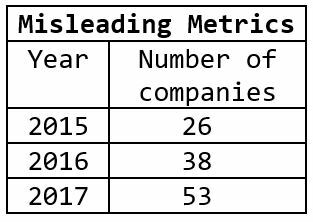 Misleading metrics and Hijacked journals: The Misleading metrics list includes companies that “calculate” and publish counterfeit impact factors (or some similar measure) to publishers, metrics the publishers then use in their websites and spam email to trick scholars into thinking their journals have legitimate impact factors. The Hijacked journals list includes journals for which someone has created a counterfeit website, stealing the journal’s identity and soliciting articles submissions using the author-pays model (gold open-access). Fake impact factor companies, 2015-2017. 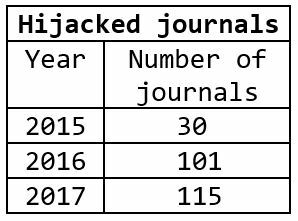 Number of known hijacked journals, 2015-2017.
denverjeffrey2015Number of predatory publishers, 2011-2017.Number of predatory, standalone journals, 2013-2017.Fake impact factor companies, 2015-2017.Number of known hijacked journals, 2015-2017.